Irene Coticchio was born in 1969 in Sicily. She received her graduation in “Modern languages and Literature” at the University of Palermo, and she completed her acting training with Philippe Gaulier in London. She studied singing with various internationally recognized singers, experimenting with different styles and directions. For her singing, theatre, dance and her studies , are just different sides of a whole, and she’s been learning parallel all these disciplines according to her interests and curiosity. As a performer she worked in several international productions including Robert Wilson, Andrew de L. Harwood, Walter Manfré. Since 1996 she’s been living and performing in Vienna, and since 2001, she is member of the Vienna based performance group Toxic Dreams. 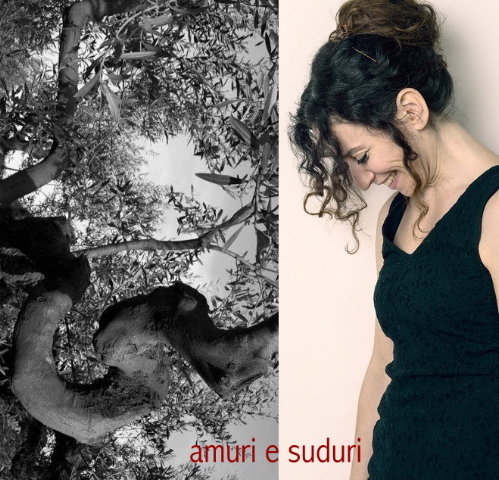 The encounter with "Fratelli Mancuso" the internationally known Sicilian duo, triggered her interest for the Sicilian traditional music. Since then, besides her activity as a performer, she’s been dedicating herself to the research work on old Sicilian songs and the possibilities of their interpretation, and performing with her band. Since 2013 she is member of Cowbirds, a collective researching and performing on monodic and polyphonic songs from Corsica and Sicily. Lately she collaborated with Dimitris Kontouras and Periklis Liakakis to te projekt "Monologos I". 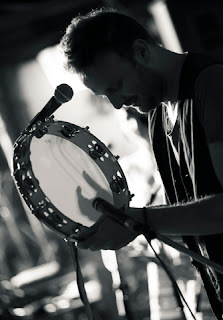 Toti Denaro was born in Rome on 4th May 1975 and started his musical training in 1991 with Sebastiano Alioto. He participated in drum seminars of some of the finest master percussionists across Italy: Agostino Marangolo, Ettore Fioravanti, Peter Erskine, Christian Meyer, Ellade Bandini, Giovanni Imparato. His musical career is often enriched by travelling and touring abroad, where he has the opportunity to perform with several master percussionists leading him to an intensive study of African and Afro-American music. He has composed and arranged music for several shows and collaborated i.a. with: Shaggy, Bernie Marsden (Whitesnake), James Christian (House of Lords), Joe Sumner (Fiction Plane), Orchestra Sinfonica A. Toscanini, M° Dimitri Jurowski, Willy Gabalier, Karl Heinz Böhm, Sandra Pires, London Simphony Orchestra, Orchestra Sinfonica di Sofia, Pippo Pollina, Giorgio Conte, Lello Analfino (Tinturia), Peppe Voltarelli e il parto delle nuvole pesanti, Eugenio Bennato & Taranta Power, Roberto Tiranti (Labyrinth/New Trolls), La Compagnia dei Folli,Ti.Pi.Cal, Mimmo Cavallo, Aida Satta Flores, Luciana Turina, Giorgio Albertazzi, Pino Quartullo, Manlio Sgalambro. Miroslav Mirosavljev (aka MICKYLEE) was born in Serbia. He studied jazz guitar and jazz composition at the University for Music and Performing arts in Graz. He was winner and finalist in several composition awards, i.a. „Internationalen Big Band-Kompositions Wettbewerb“ in Barga, Italy. He has been playing in USA, Austria, Germany, Italy, Holland, Estonia, Norway, Spain, Serbia, Croatia, Slovenia, Greece, Turkey, Tunisia, UAE, in several jazz, blues and rock festivals. MICKYLEE LIVES in Vienna where he is giving concerts, composing and teaching. Since 2015 he is teaching guitar at the private university Jam Music Lab Vienna.